Forgot to mention, but… happy late-Halloween everybody. Normally, the North Sea (北海: Present-day Lake Baikal) was a place the martial world didn’t pay that much attention to. That was because the North Sea was a land with harsh living conditions that hosted only a small population. But once the North Sea Ice Palace revealed itself, the view mainland people held against the North Sea changed drastically. The result of the battle would be decided in an instant. That was what Shi Yup thought. And that factor of the battle would work against Shi Yup. But he couldn’t do anything about it. In front of an expert like this, petty tricks were useless. What should he do, then? Shi Yup moved as soon as he thought that. His body stretched out like a stick, and rapidly advanced toward Juk Hyul Myung. It was Shi Yup’s sword. It was a flexible sword capable of waving. When putting inner energy inside the sword, the sword would turn hard and release a sharp energy. Juk Hyul Myung stepped back and lowered his posture. He didn’t want to admit it, but Shi Yup was slightly faster than he. Trying to dodge by relying on his sight would be useless. He had to slice everything that enters his aura by relying on his instincts alone. Juk Hyul Myung smiled. His opponent only had one advantage over him, and that was speed. There was no need to fear anything. The sharp feeling that rose up from his side. Juk Hyul Myung could feel dangerous energy on his neck. An extremely thick killing intent strong enough to make even him tremble. He just had to dodge this one. Just this one strike. As long as he dodged this, it would be his win. The already low posture that Juk Hyul Myung had lowered even further, to a degree where his upper body almost touched the floor. A cold feeling swept over him, and a part of his hair got cut off. At the same time, Juk Hyul Myung grinned. Juk Hyul Myung stood back up immediately, and gripped his sword. His muscles expanded as if they were about to explode. The sword slid out of the hilt explosively. The white light that cut the air. This was the beginning of Juk Hyul Myung’s attack. Shi Yup’s eyes widened in surprise. The fastest sword drawing technique in the world. That was what made the North Sea Ice Palace so fearsome. Juk Hyul Myung smiled. This blow will destroy his opponent. After all, his attack wasn’t something that couldn’t be blocked, or dodged. That was what Juk Hyul Myung believed. –When the distance between two people shorten enough, petty tricks would become useless. The voice of Neng Mu Gi resounded in Shi Yup’s head. At the same time, the sword in Shi Yup’s hand rippled a bit. The distance between them was very, very small. The closer the two were, the more important an individual’s perception and experience get, compared to skill or talent. When it came to skill, it seemed that Juk Hyul Myung was above Shi Yup. That was critical. But if the two of them were close enough to hear each other breath, even skill became useless. Shi Yup, too, was waiting for this to happen. He had one chance. He expected Juk Hyul Myung to strike at him from below. That strike was something that couldn’t be blocked or dodged. Juk Hyul Myung’s strike wasn’t something as petty as that. Because of that, there wasn’t much Shi Yup couldn’t do. And in the first place, Shi Yup created such a situation with one thing in mind. He couldn’t dodge or block, but he could kill him in the process of dying. Killing Juk Hyul Myung would be enough for him. Energy gathered into Shi Yup’s sword, and the sword began to shoot out like a snake. The sword was shooting towards Juk Hyul Myung’s heart. Shi Yup’s eyes met with Juk Hyul Myung’s midair. The two could clearly see what they were thinking. Juk Hyul Myung ground his teeth. He thought that Shi Yup would be soft, just like his appearance, but the man turned out to be a mad dog. He knew just what his opponent was going for. This was troubling. In the first place, Juk Hyul Myung had no desire to die in the wilderness with a fellow man. He couldn’t take back his sword. He wasn’t confident that he would be able to block the oncoming strikes from Shi Yup that would come afterwards. But it wasn’t like he could afford to die together with Shi Yup. He was at a tricky situation. He started this fight light-heartedly. After all, to him, the fight was just something to lift up his mood. Never did he realize that this battle would soon turn into one where he would have to risk his life. Juk Hyul Myung quickly changed the direction of his strike. He was trying to block Shi Yup’s attack. But Shi Yup proved to be stronger than Juk Hyul Myung initially thought. Shi Yup’s sword swerved around Juk Hyul Myung’s sword, and kept going for Juk Hyul Myung’s heart. That was when it began. Juk Hyul Myung kept blocking, and Shi Yup kept attacking. The fight that was supposed to be finished within a single attack was being dragged out quite a bit. In an instant, hundreds of sword strikes were exchanged between the two. But none of the strikes ever met its mark. Once a sword hit something, the winner of the battle would be decided. That was what he was going for. But Shi Yup wasn’t about to let it happen. That was what the two were thinking. If they made even the tiniest mistake, their concentration would slip, and the enemy’s sword would impale them. Juk Hyul Myung grit his teeth as he focused even more on defending. Each one of Shi Yup’s strike was a risky one. Shi Yup was focusing entirely on attacking, without giving attention to defense at all. That was why Juk Hyul Myung was unable to attack; He could see holes in Shi Yup’s defenses, but there simply was no time to exploit them. When one lost ground in a battle like this, he had to match the flow of the battle according to his opponent. Getting tired, or losing concentration would be instant death. Juk Hyul Myung’s relaxed face eventually turned to a ferocious one. Neng Ha Young bit her lip. It looked like Shi Yup was winning. After all, he was the one on the offensive. But that was dangerous. If Shi Yup faltered even a bit in one of his attacks, his body would be stabbed multiple times in an instant. The question suddenly floated into Neng Ha Young’s mind. There was no way she wouldn’t have heard the name of an expert like that. When she thought that much, however, she immediately shook her head. Wasn’t her guard, Shi Yup, like that? Even when he was a harmonious expert, the world didn’t know about him. It must be the same for that man, too. After all, no matter how much she scrolled through the various information in her head, she couldn’t think of anyone. Well, it wasn’t like that man’s identity wasn’t something important at this point in time, anyway. Shi Yup’s situation would worsen the more time passes. Neng Ha Young knew this since even she could see that Shi Yup was straining himself. Him being on the offensive would not last long. That was Neng Ha Young’s conclusion, and it wasn’t a wrong one. Neng Ha Young thought a bit, and after a while she smiled faintly. She figured out a solution. Barging into a holy battle between two men of the martial world was indeed very cheap. But Neng Ha Young didn’t care about that. To her, saving Shi Yup was the only thing that mattered, and results were the only thing that ever mattered to her. That was why she had to do this. For some reason, she didn’t want to do it. She found a way to save Shi Yup, but seeing him fight made her feel that interfering would be equivalent of sinning. Why? To her, a person who only cared about results, concerns like these shouldn’t have appeared in the first place. A line of blood formed in the air as Shi Yup’s elbow got sliced by Juk Hyul Myung’s sword. When Neng Ha Young saw this, she became outraged. She no longer had time to be concerned over anything. Neng Ha Young looked at Juk Hyul Myung. With a determined look, she opened her mouth. She sent a message to Juk Hyul Myung. At the same time, the attack that Juk Hyul Myung was performing instantly lost its power. Juk Hyul Myung’s concentration had been broken. Because of Neng Ha Young. Blood sprayed out like a fountain. It was a fatal wound. Neng Ha Young quickly moved she she saw the blood spray from Juk Hyul Myung. Shi Yup, who attacked Juk Hyul Myung the same time Juk Hyul Myung had attacked him, wasn’t that well-off either. 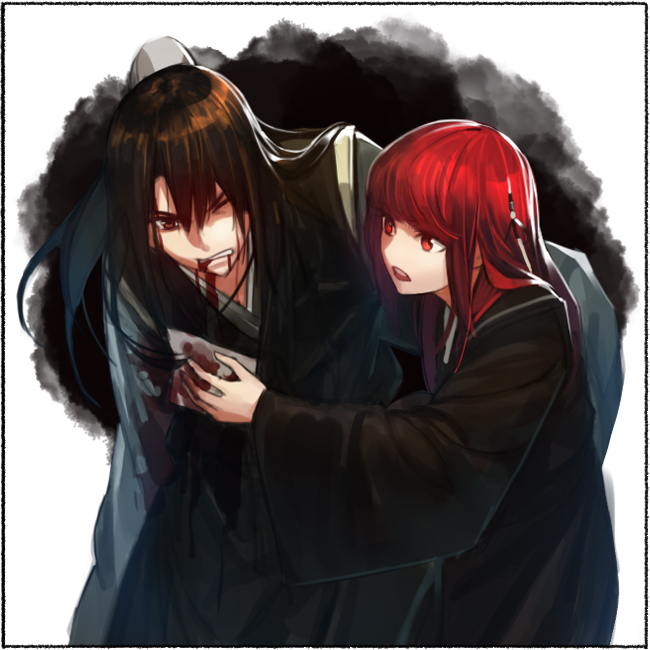 Juk Hyul Myung used a significant amount of strength to attack Shi Yup. Because of this, Shi Yup’s torso was endlessly puking out blood. Neng Ha Young ran like the wind to assist Shi Yup, and quickly applied medicine to his wounds. Juk Hyul Myung was extremely angry. He began to speak while gritting his teeth. Neng Ha Young didn’t answer. That was because she could feel that even Shi Yup was looking at her with complicated feelings. In the first place, Shi Yup shouldn’t have tried to risk his life while fighting. There was a limit to how much one could show off in front of her. Neng Ha Young thought that as she stared right at Juk Hyul Myung. Juk Hyul Myung used his sword as a temporary staff to let himself stand, and steadied his breath. His head was spinning quite a bit, which made it a little hard for him to percieve his surroundings. His rage was going out of control. That girl intervened at the most critical moment. His wound was deeper than he thought. He had to treat himself quickly, but the situation wasn’t looking too good. The girl spoke up when he made a dark face. Juk Hyul Myung closed his eyes. He was feeling a little concerned. He sighed, and opened his mouth. Neng Ha Young bit her lips. She was never treated this way in the past. At that moment, Shi Yup opened his eyes and looked at Juk Hyul Myung. He opened his mouth. Juk Hyul Myung smiled. He then wiped the blood on his mouth with his sleeves, then pulled out the sword from the ground. Juk Hyul Myung grinned. Unlike the girl, he actually held Shi Yup in a good light. Shi Yup began to think as he watched Juk Hyul Myung walk away. He lost completely. If Neng Ha Young didn’t intervene, he would’ve been a corpse by now. That was his honest feelings. He couldn’t hope for something like what saved his life to happen again. His opponent was strong, and if the battle continued for even a bit, he would have definitely died. Shi Yup tried to stand, but fell back down. Shi Yup nodded when he heard Neng Ha Young’s question. The two of them didn’t know at the time. They didn’t know that they had actually survived a battle against the future Sword King (劍王)……. They would only find out about this in the future. GRRRRR I Wanted to find out what happened to Cho Ryu Hyang!! *headdesks* Oh well….at least we find out the outcome to this other battle. Thanks for the chapter! I am collecting them as it updates, I just upload it in bulk of 50 chapters, I have 251 up to the current chapter as well which is 293 at the moment. This author is a genius at having his reader (or me at the very least…) love and hate him at the same time. I mean, coooome oooon, with the last chapter’s beginning i totally thought we would see the MC’s parents and instead! Sorry… i just really had to rant about it D: My poor heart .__. Really awesome chapter, thanks alot ! I think he’s probably angrier at himself for being so weak that her intervention was necessary. That and shocked and relieved that he’s still alive. If he’s angry at her at all, he’ll likely get over very quickly. Dieing in a meaningless fight isn’t really why he trained all those years and has nothing to do with protecting her after all. And—-we’re back to shi yup and xie ming—Still, still so much tension! Xie ming, if you don’t want to die, don’t pick fights! I…I…It’s not like i don’t get what he’s thinking, but as a character, shi yup’s better than xie ming to me. Yes, ha young, please…please stop this ridiculous fight! I mean, if it’s mutual sparring, it’s fine, but…xie ming, oh xie ming, why do you do this?! Hm, yup, totally don’t like this guy. Hmph! His strength is the only thing he has going for him. But, really, good job, ha young! For stopping the nonsensical fight! Also, i think i’ve somewhat grasped the author’s style. So, probably the next chapter or two, is when ryu hyang’s situation will appear again! Anyway, since this fight is done, ryu hyang will apper again soon, and hopefully for consecutive chapters! Oh, yay, i’m really curious to see how the chapter with ryu hyang turns out! Hm, a chapter in gongson chun gi, yes, that should be very interesting, i’m looking forward to it! How many chapters does this series have in all? Sorry for responding so late. Tests and stuff held me down for a while. Umm… I believe you can find the total chapter # in the King Shura project page.